Pioneer’s A-70DA and A-50DA receive first UK showing at Bristol | What Hi-Fi? Pioneer launched the two integrated amplifiers at IFA 2015, but they’re being demonstrated for the first time in the UK at the 2016 Sound and Vision Show. Pioneer has fitted both amps with an 8-channel ESS DAC that allows for 4-channel parallel drive on the right and left channels. It supports hi-res audio up to 32-bit/384kHz and DSD 11.2MHz. 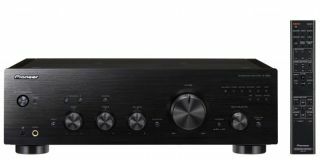 Both are driven by Class D amplification and feature a small internal circuit and heat sink, which Pioneer says allows the amps to “drive with greater efficiency and provides a reduction in signal loss and interference”. Connections across the two amps include MM phono, USB, coaxial and optical digital. The A-70DA has the added benefit of supporting MC cartridges and a balanced XLR3 input. Both amplifiers will be on show at Pioneer’s stand at the Bristol Show, with the XDP-100R digital audio player being used as a source device. The A-50DA and A-70DA are available now for £699 and £1199 respectively.